It has been estimated that up to 2% of the world’s urban population depends on waste either directly or indirectly for their income. Informal recycling systems reduce negative impacts on the environment, as well as provide the poor in developing countries with jobs, supply industries with raw materials, and reduce the stress on municipal infrastructure, such as collection and landfills. In his 2012 masters thesis, Mike Tuori found that the informal recycling supply chain in Bandung, Indonesia operates with a high level of efficiency, but the system fails to address issues of the protection and promotion of the workforce involved. 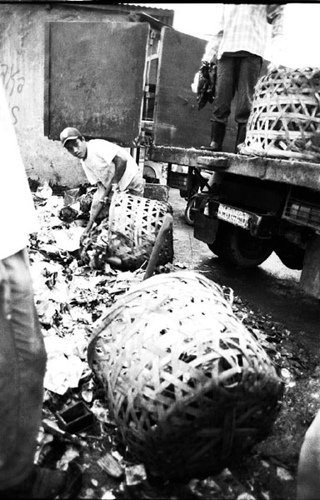 He argues that policies have focused on the waste pickers, but have ignored the “middlemen” in the chain. Mike presents a framework for evaluating informal supply chains based on the perspectives of all stakeholders involved, taking into consideration aspects of both efficiency and social concerns, and evaluating each against a given set of metrics. His policy recommendations include investments in health and safety infrastructure and promotion of corporate social responsibility initiatives. Mike suggests the relevance of his findings are not limited to recycling, but applicable to various informal economic systems. Read Mike’s full thesis here. Posted on September 13, 2012, in recycling and tagged environment, environmental poilcy, Indonesia, landfills, plastic, recycling, social responsibility, trash, waste. Bookmark the permalink. Leave a comment.